Bay area artist Harry Leaf celebrates six-string history with his ceramic guitar sculptures. Whether it's a Grateful Dead jam session or a three-chord masterpiece by Green Day, San Francisco has resounded with unforgettable guitar riffs. Bay Area artist Harry Leaf celebrates this six-string history with his handmade ceramic wall sculptures. 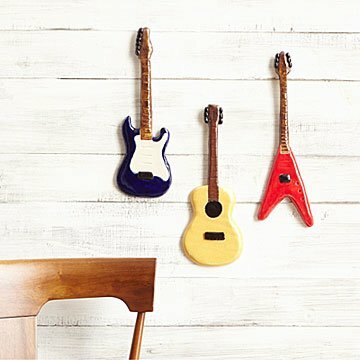 His acoustic and electric models make playful decor for any avid music fan who loves the iconic forms of the instrument. Handmade in San Francisco, California. San Francisco law student-turned-sculptor Harry Leaf earned his law degree in 1989 before asking himself "what was I thinking?" He soon redirected his path to pursue his true passions: painting and sculpting. He sculpts touching and curious forms that inspire and delight, made to bring everyday art and humor into the lives of art lovers. Harry's glazing and design techniques have evolved over the years to include a variety of colored clay, finishes, and firing temperatures—spinning new and unusual textures for exceptional new pieces. He hand-crafts and hand-glazes each piece in his San Francisco studio. Dust as usual; rinse under water if necessary. Each guitar will arrive ready to hang with hanging hardware included.